The Maldives is one of the world’s hotspots for manta ray activity and is home to the largest and most studied populations on the planet. In fact, this archipelago is one of the best places to visit if you want to enjoy diving with mantas. But you might like to know that there is a precise relation between the location you intend visiting and the period of the year you choose. The reason is that manta rays are filter feeders and eat huge amounts of plankton. While planning your trip, it is important to understand which is the right location to meet mantas, depending on the time of the year. A haven of natural tranquility, Olhuveli Beach & Spa Maldives is a top destination for seeing some of the world’s rarest sea creatures. 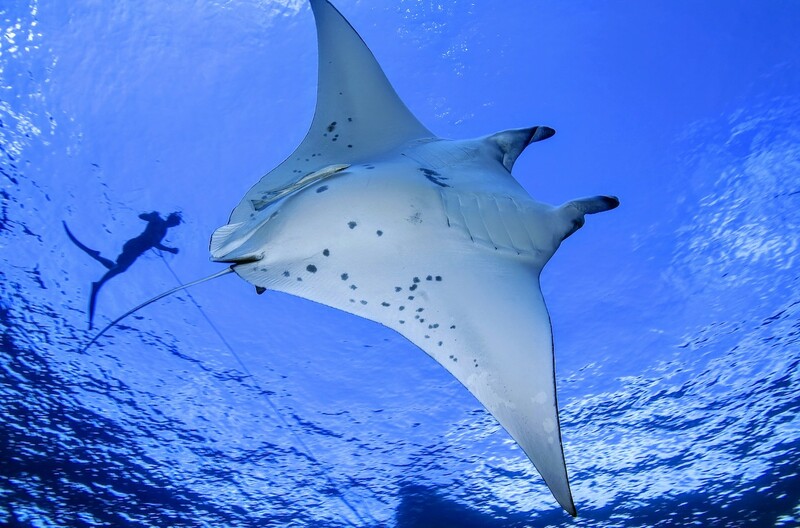 Until November, enjoy the ‘manta ray season’, offering divers, snorkelers and even dry-land spectators an even greater chance of spotting one of nature’s unusual creatures. They thrive in the Maldives’ waters. Especially during the summer months when the higher level of plankton in the water and prevailing winds and currents of the hot weather entice rays of all sizes to migrate to Olhuveli’s tempting shores. One of the most exciting experiences Olhuveli offers with manta rays is seeing them from the jetty at dusk, when its spotlights entice shoals of frenzied fishy activity. These muscular creatures flip in and out of the water. A wonderful experience for those wanting to watch nature’s theatre played out to the backdrop of a perfect sunset. To snorkel or dive with manta rays is an almost indescribable experience. They move through the water with such grace, gently soaring through the turquoise lagoons, over reefs bursting with life. It is truly a magical feeling to see these creatures fly through the water. Manta Rays are inquisitive by nature and if you can control your excitement and remain still, the rays will swim around you with tremendous elegance. Nestled amid lush tropical vegetation and shaded by graceful palms. Encircled by stretches of powdery sandy beach and a vast crystal clear lagoon, a truly breathtaking island with plenty of secluded sandbanks where paradise seekers escaping from the pressures of daily modern life can forget the outside world and let go of all inhibitions. Beautifully designed villas stand over turquoise waters, fusing modern flair with traditional architecture, white sandy beaches giving way to endless sea views that stretch for miles. It is truly a place where mind and body can relax, the senses can be invigorated and spirit will feel soothed. Set in the turquoise heart of the Indian Ocean that is Maldives, Olhuveli Beach & Spa Maldives is situated at the tip of South Male’ Atoll and offers one of the best luxury water villa accommodations, restaurants and recreation activities. It is made easily accessible by a 45-minute exhilarating speedboat transfer from Velana International Airport.